Join the SF Sales Development Forum and Sales Bootcamp as we host leaders from Salesforce, Slack, and Apttus next Tuesday! 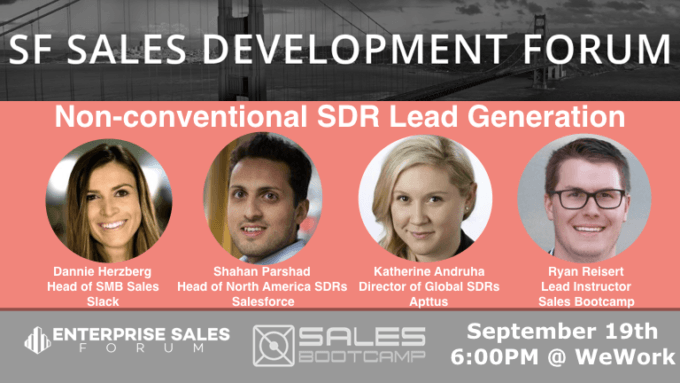 Join the SF Sales Development Forum and Sales Bootcamp as we host leaders from Salesforce, Slack, and Apttus to discuss Non-conventional SDR Lead Generation. Sales Development has come a long way since the days of only cold calling and cold emailing. We’ll discuss everything from gifting, video email, direct mailers, texting, and other effective techniques that these sales leaders are doing with their SDR teams to help convert more sales.